You know when you are about to say something sensitive and you disclaim, “Some of my BEST FRIENDS are…” Well, I write this knowing that some of my best friends are USAirways employees. Just not the ones I am about to mention! 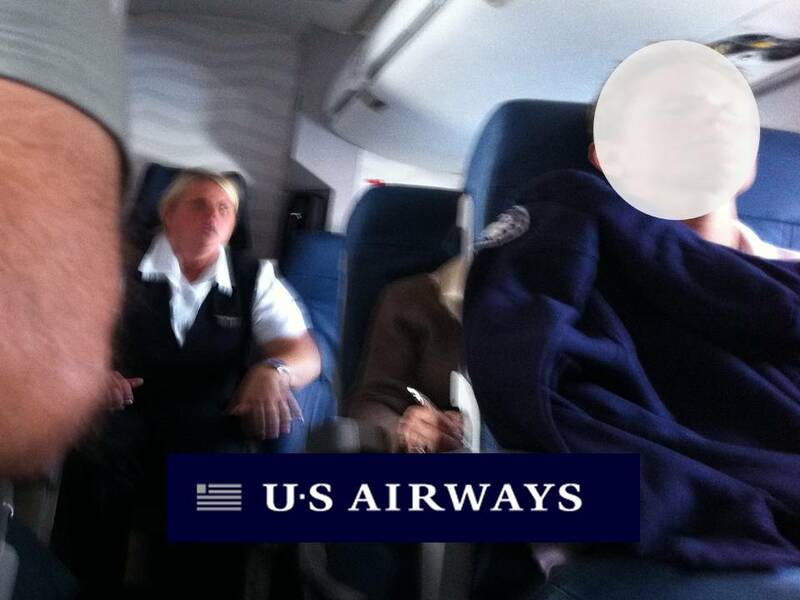 I haven’t flown USAirways in nearly forever and NOW I know why. The employees seem to be sooooo miserable! Going back to Pittsburgh. We meet flight attendant KEELY (sp ??) seen in photo above (yes I realize its blurry). As we board, she is in the front of the plane talking on the internal phone. I have no interest in listening to her conversation but I just happen to be stuck there while customers load. WAIT! Keely, isn’t this the part where you’re supposed to be doing your half-hearted greetings – “Hi! Hello! Hi there. Welcome aboard. Hello. Hi. Hello! Welcome… (you get it).” OK, STILL not a biggie to me. I hear the same conversations between teenage workers in the check out line at Giant Eagle. I nearly CRAPPED my pants!!!!! Soooooo BEFORE this becomes a total diatribe; to Keely and the other USAirways employees – I realize the USAirways senior execs stole your pensions, your raises, your jobs and your bennies but, if you’re THAT miserable, its time to grab a beer and jump down the emergency slide. And, dearest Keely, nice work SCOLDING your customers like a scene out of Kindergarten Cop when you can’t seem to “concentrate” on that repetitious “safety talk” that you give 1,000’s of times a year, YA JAGOFF!